The month of May passed in a blur and here we are in mid-June. I’m not at all sure where the time went! There was planning for our guild as it was our elections month and I decided to get involved with the workshops committee for next year. I will be organizing the October program, which meant there was some discussion with our programs coordinator. Some friends came up with a brilliant idea and within about three days, over 75 emails had flown between us. And lastly, I’ve been writing up a storm for an upcoming PLY issue. All to say, there’s been a lot of planning and organizing. Oh! and there was the spinning and blogging about May’s fibre club, Daydream, from Sweet Georgia Yarns. It sounds like a lot of things that fell on my plate but it wasn’t really. Being at home with the kids Monday to Friday means I have about 2 hours in the evening to spend thinking and dreaming about my making. If I start to feel overwhelmed in this world of making, I immediately take a good hard look at what I’m saying “Yes!” to and remove things from my commitments list. Setting strict boundaries with myself has been a huge learning curve since having kids. And not in the way you maybe think! I used to say No to everything before having kids. Rarely would I commit to something I didn’t whole-heartedly believe in or was really excited about. After having kids I felt that getting out and being involved with things in my community was really important. Of course, invariably, I started to take on too much and say Yes to too many things. Taking time away from my family takes my energy and resources so if I’m going to say Yes to something, it has to be good. Really good. 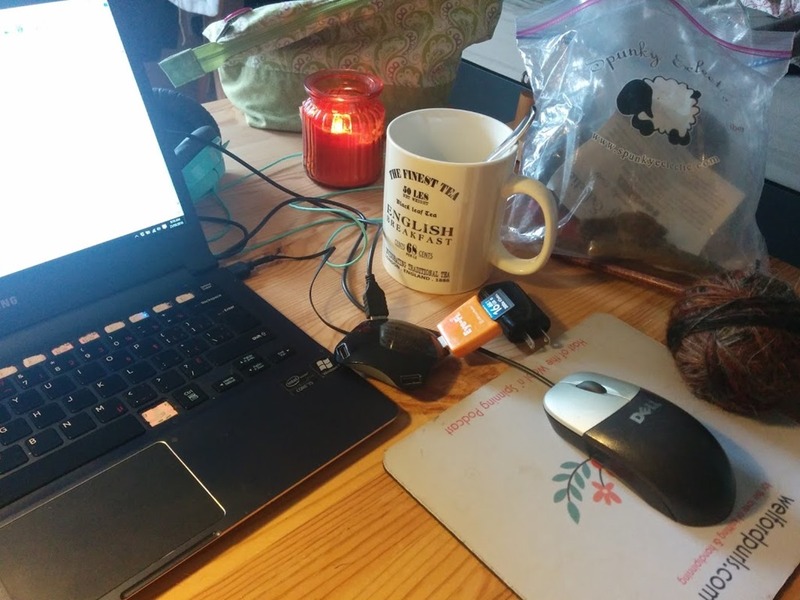 A wise person (a friend’s husband) said over coffee one morning in early May that if you aren’t excited about a project at the outset, how are you going to feel half-way through the slog of said project? The reality is, it won’t be life-giving and enjoyable. It’ll be a slog. Freeing up my time and energy to focus on these other things has brought me to the conclusion that letting go of the podcast is crucial at this point. It is no longer on hiatus but instead, completed. I have so enjoyed making it and hanging onto it a little longer meant I didn’t have to admit it was over. The time has come, however, and I wanted to thank each and every one of you for sticking with me! As you may know, I’ve been toying with a new format and incarnation so please stay tuned as I so love the video format. The time I have re-claimed from recording and editing schedules has meant that I have been able to focus on other projects (see above! ), as well as spin up some small, meditative projects that have brought a lot of joy to work on. One of those such projects is my deep stash Icelandic from Spunky Eclectic’s December 2015 club. 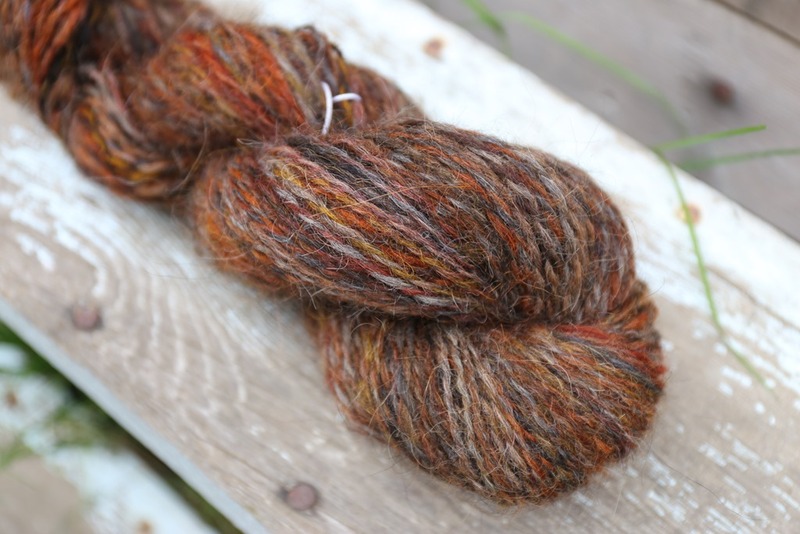 Spindle spun and plied, I experimented with this fibre before committing to spinning it as a heavy DK two-ply. 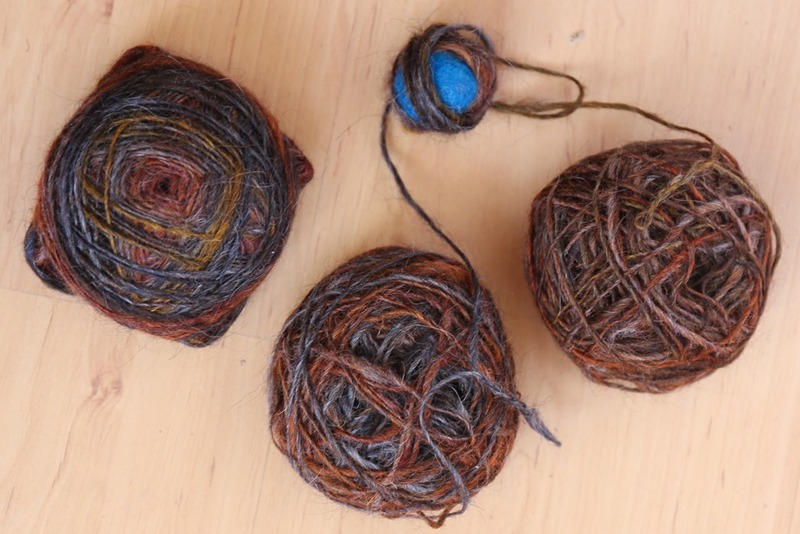 Using my favourite TurtleMade turkish spindle, I spun 25 grams four times, created two plying balls weighing 50 grams each (two 25 gram balls – see photo above) and plied on my Snyder Spindles Steampunk (see photo below). The end result were two 50 gram hanks of yarn, one for each mitten! Multi-coated sheep breeds include Shetland (which is one of my favourite fibres to spin), Icelandic, Karakul, and others. 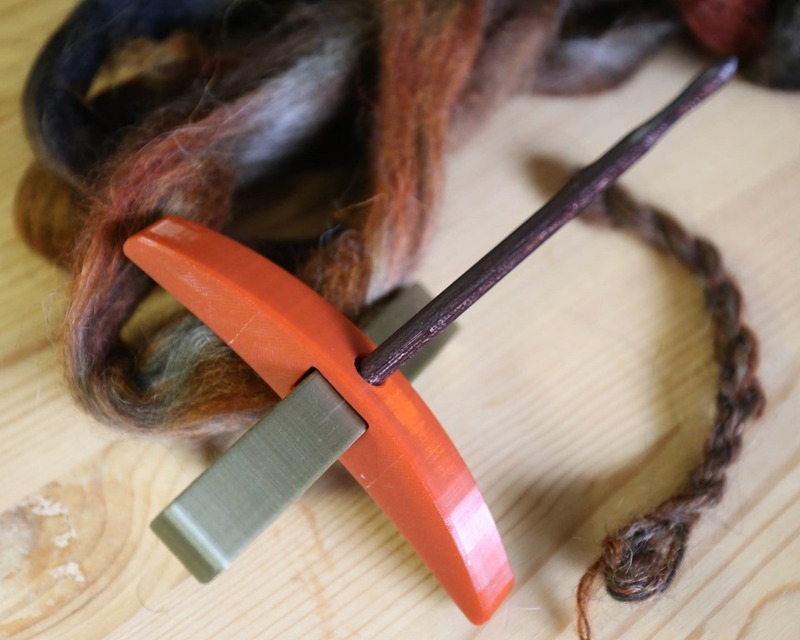 While I am dyeing to go to Iceland – it is a trip my husband and I have discussed time and time again – I have to live vicariously through spinning their beautiful sheep fleeces instead! Icelandic sheep possess both a tog, the coarse outer layer of fleece, and the thel, the downy short-stapled inner layer of fleece, as the term multi-coated implies*. 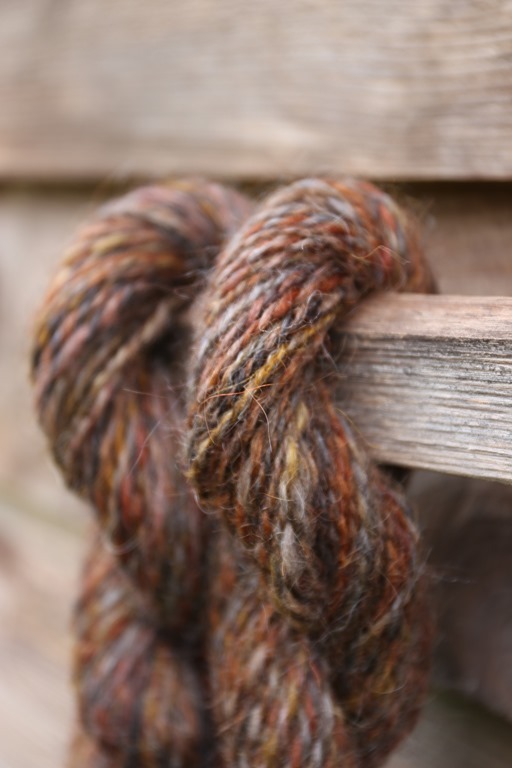 When the fibre is no separated, and the two are left together, it can create a ropey, wiry yarn if overspun. 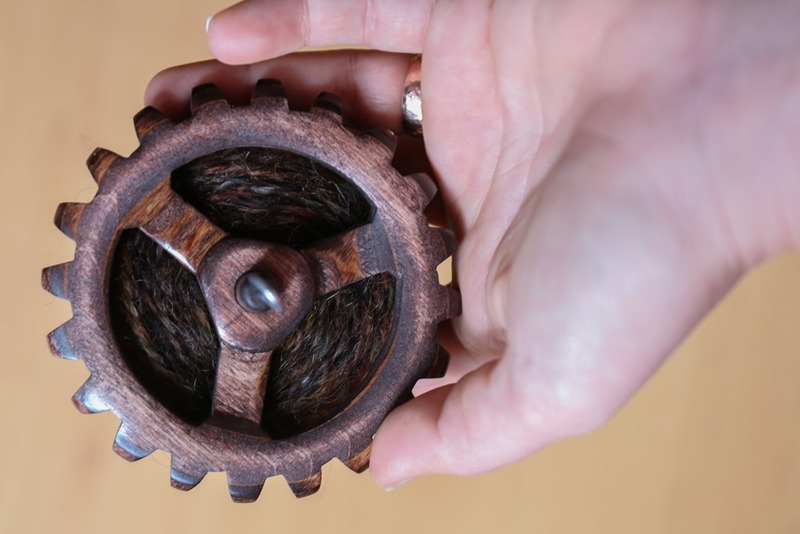 I decided to try spinning this on my 34 gram TurtleMade spindle because it is so slow. I don’t think I could over-spin yarn unless I tried really hard. While plying, I decided to only add enough ply twist that the yarn twisted back on itself 3-4 times before winding it onto the spindle to store. 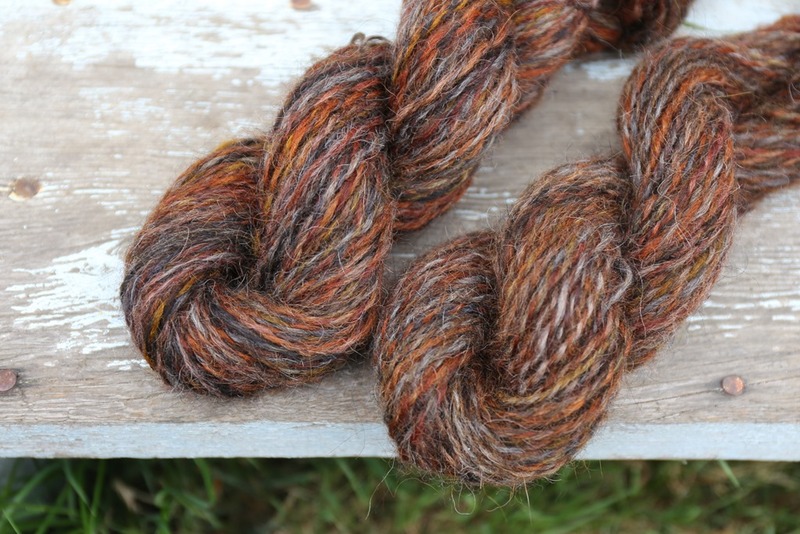 This has created a low twist yarn after washing and setting the twist. I thwacked the yarn and hung it to dry afterwards. While it didn’t soften up particularly after washing, it is a lovely yarn regardless. For sturdy, hard-wearing mittens, the yarn will be lovely. Can you believe that I don’t have a pair of knitted mittens in regular rotation? I really need a pair of fingerless mitts, not full mittens, so I’m torn about pattern choices. Do you have a favourite pair of mitts that you wear regularly? I was looking at my friend, Diana’s free pattern on Ravelry called Simple Lines. The gauge and yardage requirements match perfectly so there would be no math, which is pretty standard for me with most of my knitted items. Working through a smaller, 100 gram braid of fibre reminded me of the enjoyment I receive from simple projects with simple outcomes. I love those larger projects that mean I can cast on for a sweater – in fact, those are my favourites – but these enjoyable, small projects are really wonderful, too. I even decided to buy something completely out of character for me and join the Nest Fibre Studio’s fibre club. I chose to receive the shipments in 3-month parcels instead of month-by-month, which made the club incredibly affordable. I’m excited to spend some time with these smaller braids of fibre and maybe begin thinking about combo spins again. Smith, B. (2014). The spinner’s book of fleece: A breed-by-breed guide to choosing and spinning the perfect fibre for every purpose. Storey Publishing: North Adams, MA. Oh man, I have such an obsession with fingerless mitts. They work really well for the climate here in Scotland and I love to have my fingers free. I really like the ones you linked to. Lovely simple mitts that will certainly go in my favs for future reference. I also really like the Maize mitts by Tin Can Knits for simple mitts. It’s funny because our climate here in Vancouver is similar to Glasgow and I don’t know why I haven’t delved into fingerless mitts?! I guess one pair at a time! I love the halo that you get with Icelandic wool. 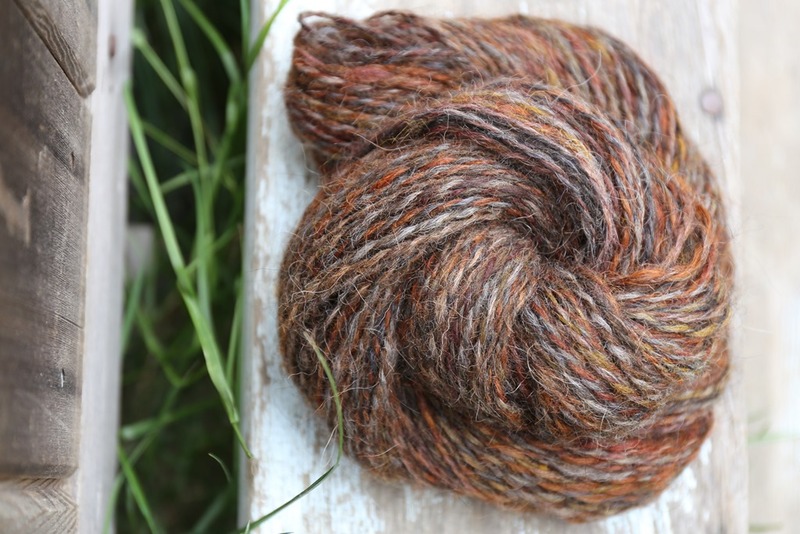 I have never spun it, but you are inspiring me to try. Your yarn turned out beautifully, Rachel. Thank you Kat 😃 I’ve had some disasters with Icelandic so I thought I’d try a different approach and it worked beautifully. Writing for PLY?!!! That’s huge! But not surprising. I can’t wait!